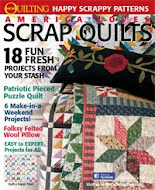 Do you subscribe to any print quilt magazines? I used to subscribe to them all. It was like Christmas or my birthday when one would arrive in the mail. I would pour through every page hunting up new projects, looking for trends, colors, or ideas which would inspire me to sew. Later it became a source of inspiration for my own designs. I felt I needed to stay aware of what was being published, and what quilters were buying and making. I wrote off my subscriptions as a research expense. Then when my patterns started appearing in magazines I had even more incentive to see what was being published. I had to scope out the competition. As I moved from publishing designs in magazines to publishing patterns I began to let my subscriptions lapse. It was a lot of money and I found that I was letting issues -- still in their bags -- pile up on the coffee table, lonely and unread. But I kept my subscription to Quiltmaker up to date. I loved those Patch Pal patterns in every issue. I vowed someday I would make them all. Their style was in sync with my own and I always felt my patterns would be a good fit for their editorial style, despite the fact that I never sent them any designs. I did have a block in the #2 100 Blocks volume, but didn't send any others as you don't get paid for those. So today 2 amazing things happened. My July/August issue arrived in the mail. I had been tipped off by my friend Christie in OKC that there was a Patch Pal Flamingo in this issue so I was anxious to see it and scope out when I would have time to make it. Sure enough, there it was, and just as cute as I hoped it would be. But then I started thumbing through the rest of the issue and an ad caught my eye. After I gasped I looked closer and sure enough, that was MY QUILT in the Keepsake Quilting Catalog ad. They really should warn you that they are going to do that to fend off potential heart attacks when designers see their work in a magazine without prior warning! NOTE: One also does not get paid when one's work appears in an ad in a magazine, fyi. 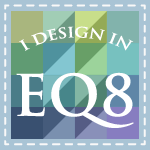 However, if you were to go to Keepsake quilting and purchase that pattern, this designer would get paid (cha-ching!) Even better, if you go HERE and purchase the pattern, this designer gets paid more (cha-ching-a-ling). I noticed they are out of stock! Hey I shipped them more today so they will be there soon! They had been offering kits to go with this pattern. If you want one, give them a call and ask when they will have them. 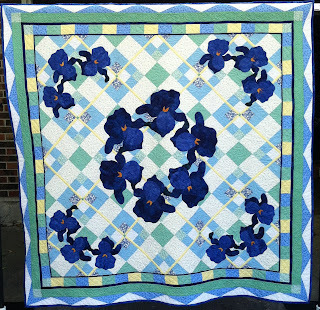 I will also have kits for sale at the Kansas City Regional Quilt Festival June 19, 20, 21 in Overland Park, KS if you want to pick one up in person. Keepsake still has my Vintage Sampler pattern and kit on sale. They have discounted the kit price on the Summer Iris Picnic Quilt. Now would be a great time to pick up a kit for less $$. Don't you love an intriguing headline? Hehe. But in reality I get a lot of questions about fusible web when I teach and lecture. So here are a few thoughts on fusible web. I thought I would share my preferences with you since I tend to publish a LOT of patterns with raw-edge applique applied with fusible web. Everyone has their preferences but here is some information about using fusibles to help you make the best choice for your projects. 1. To use fusible web your applique pattern needs to be reversed. This is because you trace the pattern on the fusible web paper backing then apply to the BACK of the fabric. This process reverses (creates a mirror image) of the original design. 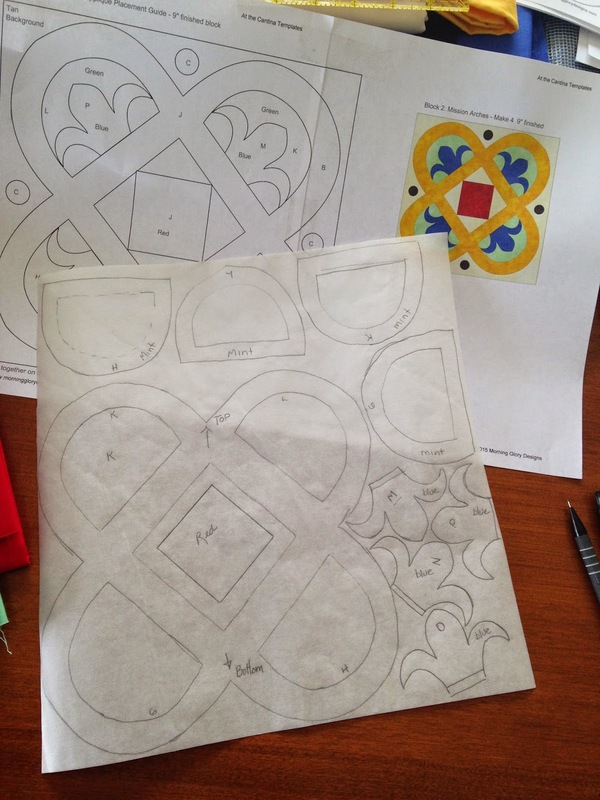 When you get ready to trace your applique templates check the pattern carefully to see if the templates are reversed. If not, you will have to reverse the templates FIRST, then trace them onto the fusible. If you have a light box or an easy-to-reach window, you can tape the originals up backwards and trace onto fusible in one step. In the picture above I show a block design with the applique placement guide. The templates are traced off of a set of templates which are first reversed than separated into individual templates on the page. This is more work for me, but less work for you when you get the pattern! Now what kind of fusible web should you use. There are a lot of them out there on the market, so let me talk about a few of the brands I have used and the ones I like the best. Light weight fusible webbing is best for most applique which will have overlapping layers. It is thin and keeps your pieces from being stiff. But lightweight fusible MUST be stitched down as the edges can become loose in handling or washing. The optimum stitches to use are a machine blanket stitch, and small zig zag stitch with matching thread, a blind hem stitch or a satin stitch. Some use a straight stitch close to the edge, but I don't think that looks as well. Satin stitch is the hardest to get looking good and takes the most skill. The zig zag and blanket stitch are pretty forgiving and can look good with a little practice. Machine blanket stitch using a variegated thread. Heavy weight fusibles are great for mending and securing heavier fabrics to your background. They do not need to be stitched down unless they will receive a lot of handling, washing or wear - think denim patches your mom used to put on the knees of your jeans. I prefer to use these on craft-type projects and resist using them on quilts. When deciding which brand of fusible webbing to use it helps to know what the characteristics of each brand are. 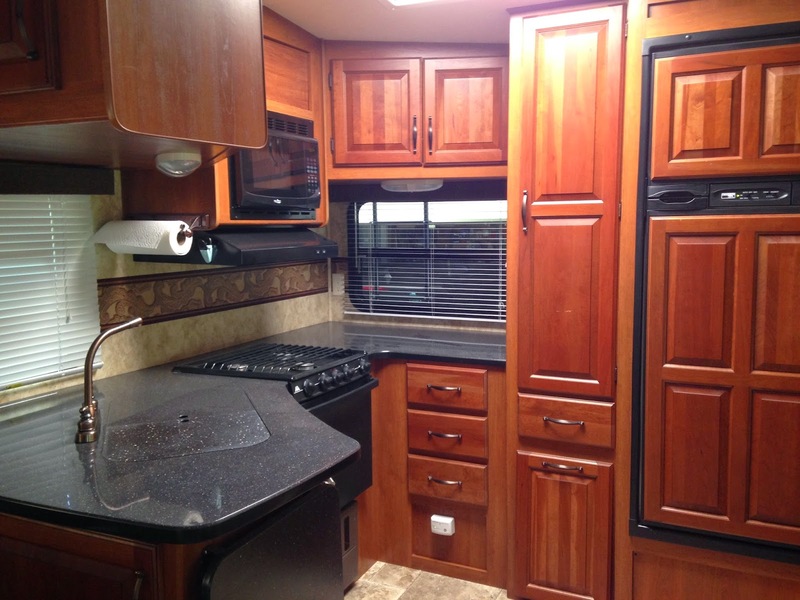 Here is a great review of various brands of fusible web. 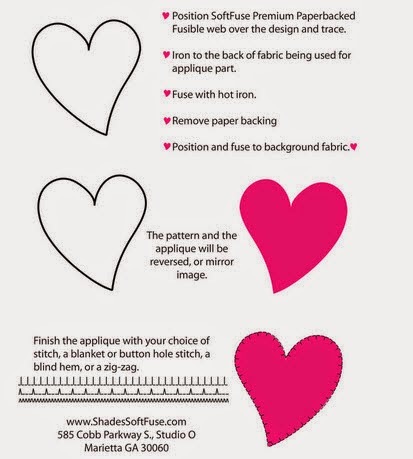 My favorite brand of fusible web is Shades "SoftFuse." It is a thin and light weight fusible with paper backing. It can be used with a hot dry iron, and holds extremely well when fused. It is my brand of choice when I am doing overlapping layers as it does not add any stiffness to the applique. On the down side it is also one of the most expensive brands on the market and you have to look for it, since it is not commonly carried everywhere. You can buy it online and it does come in a variety of sizes and shapes. Next on my list of favorites is Steam A Seam which is made by the Warm Co (they also make batting). 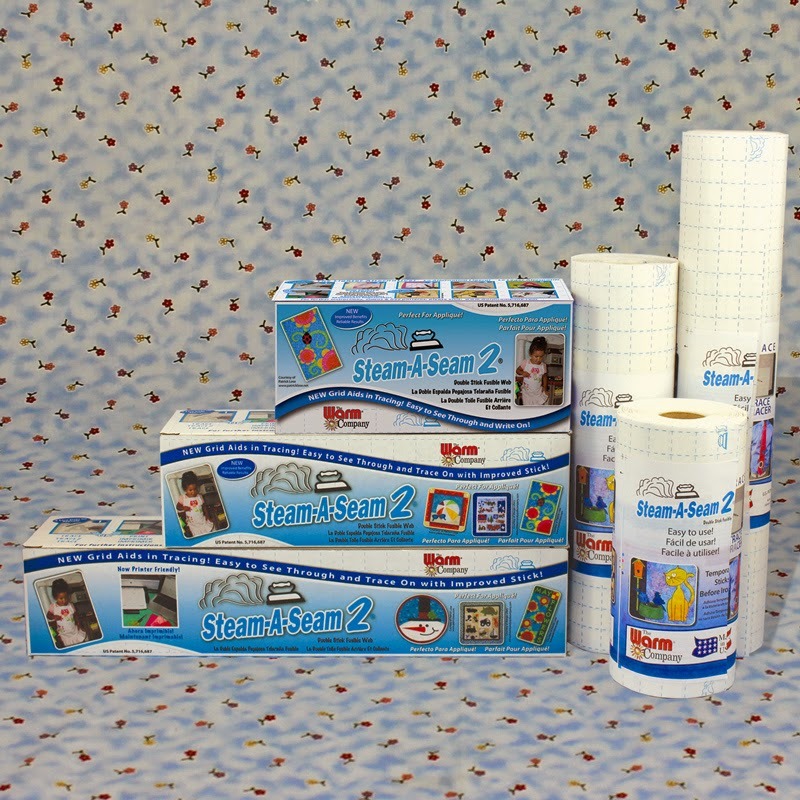 They make a light and a regular product and they also make a product called Steam A Seam 2. The 2 means that it is sticky on both sides and will stick to both the applique and background fabric. It is movable or positionable until you fuse it. I love this characteristic since I often move pieces around a lot until I am satisfied with their placement. They won't slide around or move while I am working with a lot of pieces at a time. I typically use "Steam A Seam 2 lite" because it is light and flexible, sticky on both sides, easy to work with, available everywhere in lots of sizes and shapes, and can stand a very hot iron. Heat N Bond and Heat N Bond lite are also widely available and good for applications where a hot iron would damage the fabric. They require a medium iron -- too much heat will dissolve the bond between applique and background. Since I tend to use a hot iron I have to be careful when using this brand, and remember to turn down the temp on my iron before fusing. Wonder Under is a common fusible web available in the chain stores like Joann's and Hancocks. It is very inexpensive, comes on a bolt so you can get big pieces if you need it, and is easy to use. Watch your iron temperature with this and follow the instructions carefully. I have had mixed results with Wonder Under, and find that it adds a bit of stiffness to my work. I have had some difficulty removing the paper after fusing. Pellon made a knock off for Steam A Seam. It came out to replace Steam A Seam during the last two years when the Warm Co had suspended manufacture of their product while experiencing a shortage of parchment paper. It was a complete disaster. You cannot remove the paper backing. Pellon is a highly respected brand but they scored a miss with this product. In my next post I will share some of my favorite tips for using fusible web, including great machine stitches and hints for making them look professionally done. 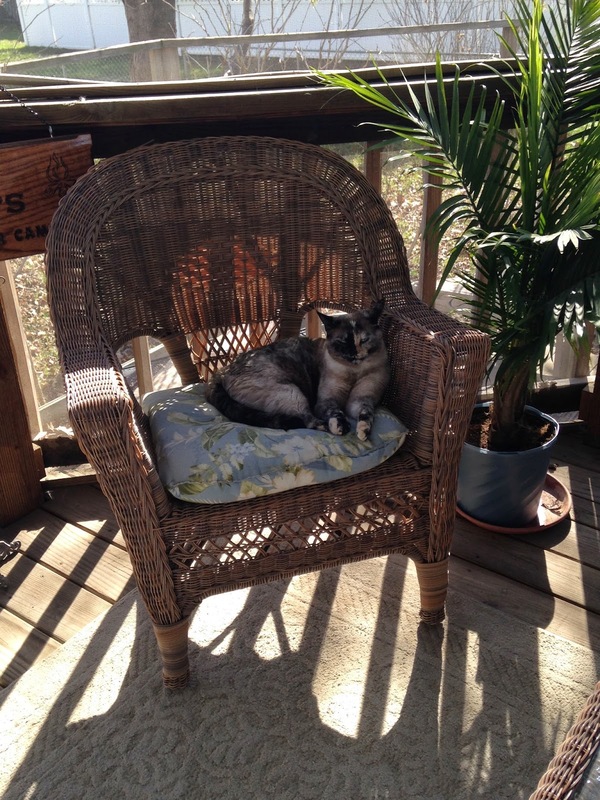 ty of the wicker chairs. 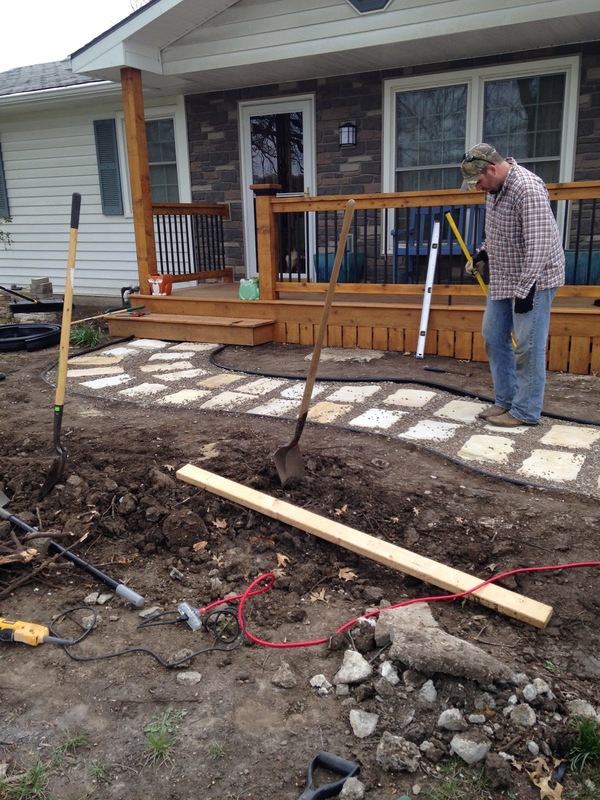 The front porch redo is finally finished and the guys put in my new front sidewalk on Easter Sunday. The mess is now all cleaned up and grass is growing in all the bald spots. 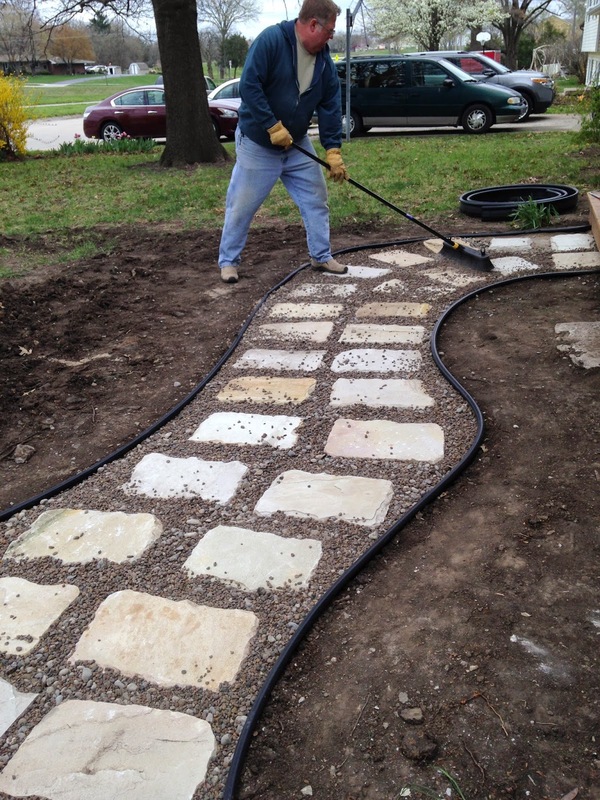 I will plant hostas along the front of the house and finish landscaping along the walkway next week. 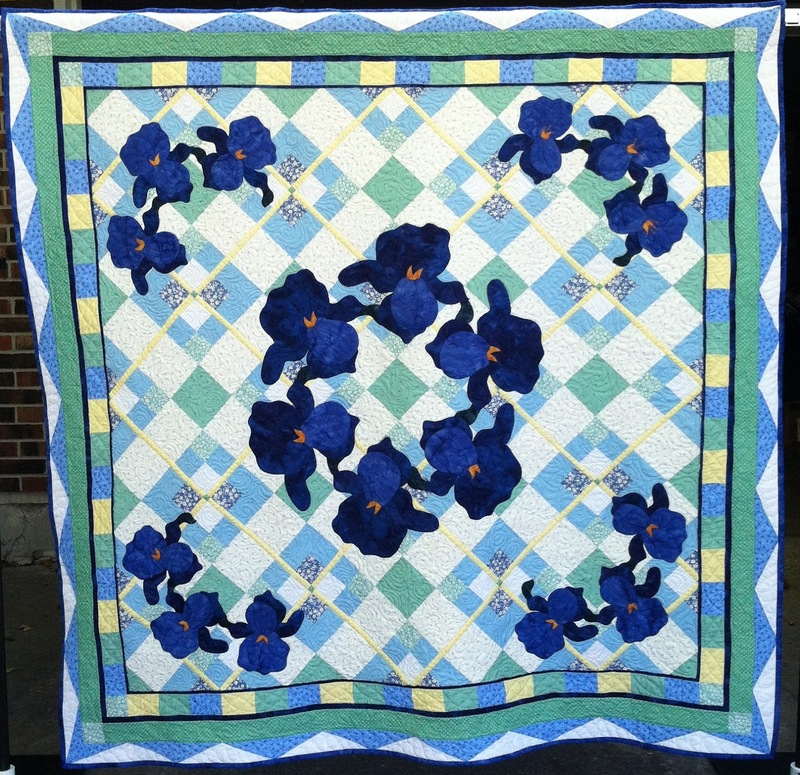 Of course May would not be complete without a beautiful new free block! 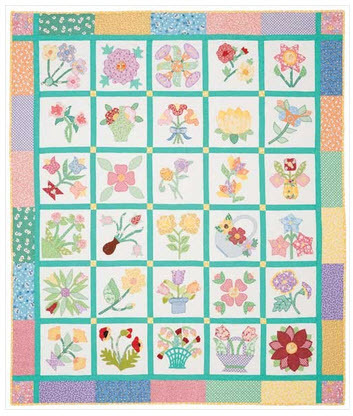 The free May block is posted and ready to download. And I gotta admit, it is one of my favorites. Despite loving the turquoise color, I love the funky tulip shapes and graceful art nouveau lines. Click on the 2015 BOM Tab at the top of the page on my blog to download your free block during the month of May. The bonus block is available to my newsletter subscribers. This month it is a stylized rose in shades of lavender and blue-violet. You don't want to miss it. Not a subscriber? You can purchase these blocks Here. 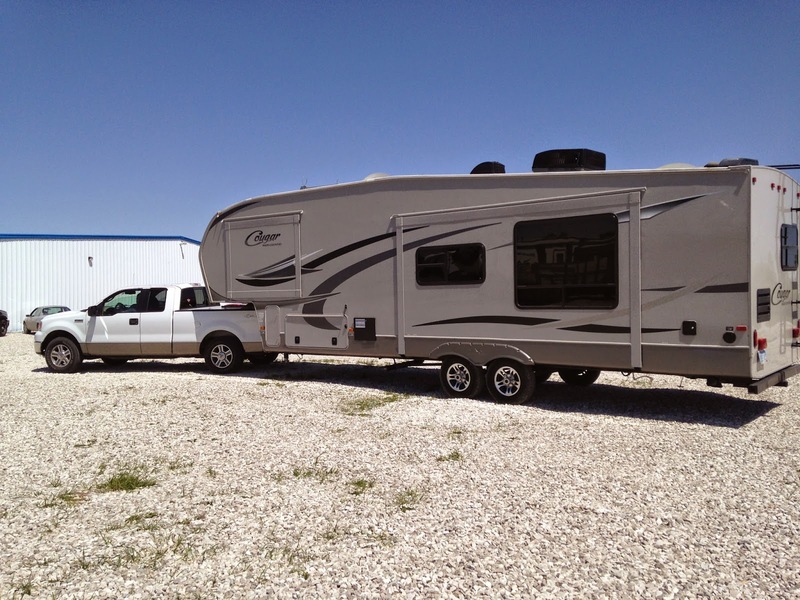 The other reason I love May is that it heralds the beginning of camping season. I love spending time outdoors, at the lake, in the woods, just about anywhere. And of course that means getting the Whale out of storage. Next week I am heading off to Cedar Rapids, IA to teach at MQS. 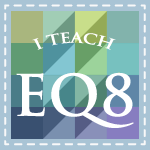 I will be doing three EQ7 classes, so if you are in the area or coming to the show, it would be a great time to sign up. Then we head up to Minneapolis for Spring Quilt Market the next week. Really looking forward to that. If you are going please stop by the Quilt Woman booth where I will be helping out. The end of May the Whale will be going to our annual 39th college reunion at Mohican in central Ohio. It will be quite a trip and I am so looking forward to spending time with quilty friends along the way. OK, now off to recover some chairs for the whale. What are your plans for May?